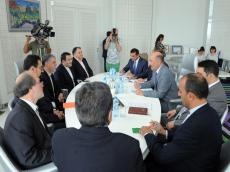 Azerbaijan's Minister of Culture and Tourism Abulfas Garayev held a meeting with the Minister of Culture and Islamic Guidance Seyyed Abbas Salehi on June 27. At the opening of the meeting, Abulfaz Garayev said that Azerbaijan and Iran are two fraternal states that support each other in the international arena and are in solidarity on many issues. He expressed satisfaction with the level of development of bilateral ties in the field of culture. The minister recalled that last year the Days of Azerbaijani Culture in Iran were held at a high level. Seyyed Abbas Salehi, for his part, expressed gratitude for the warm welcome, adding that the main purpose of his visit is to hold the Days of Iranian Culture in Azerbaijan. He stressed that such events will give a new impetus to the development of bilateral relations, promote familiarity between cultural and art figures of two countries. It was noted that concerts with participation of Iranian masters of arts, exhibitions, screenings of films and theatrical performances are planned within the framework of the Days of Culture.